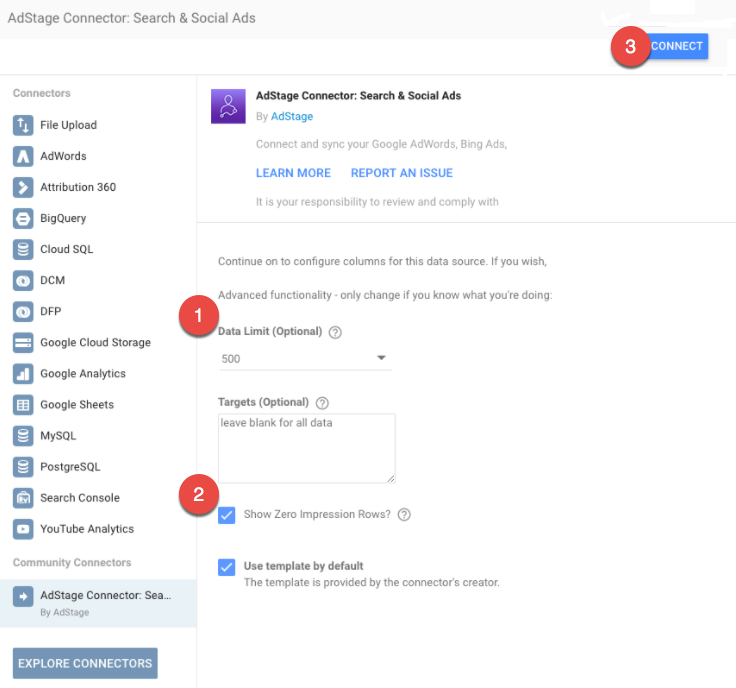 AdStage's Google Data Studio community connector brings performance data from AdStage's metric system into Google's new reporting tool, Data Studio. This integration lets you report on your search and social performance data by creating shareable charts and graphs in a few clicks. 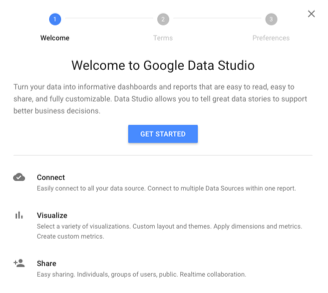 Step 1: Accept Google Data Studio's terms and conditions. Navigate here and click the blue plus sign button in the bottom right-hand corner. You'll be prompted to follow a few steps and accept permissions. If you've already played around with Data Studio before, you have already completed this step. 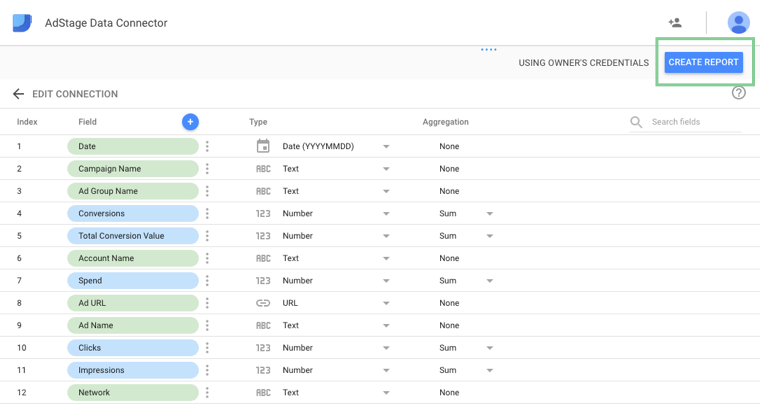 Step 2: Authorize Data Studio and AdStage Data Connector. Navigate here and click Authorize to authorize the connector. 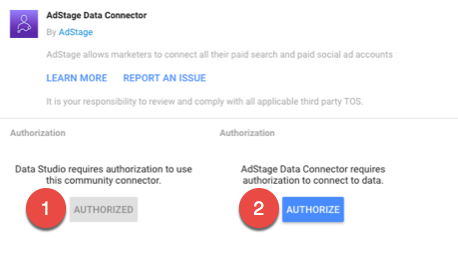 Once you've authorized the connector another authorization button will populate prompting you to authorize pulling data from AdStage. At this step, you'll log into your AdStage account. Step 3: Update settings and Connect. Once you've authorized the connector and your AdStage account, update the default settings to your preference. We suggest setting the data limit to the max of 500 and checking the Show Zero Impressions Row. This way you'll display the most data possible. Once you've done that, go ahead and click Connect. Step: 4 Click Create Report. Update the attribute preferences to your liking, or leave them on the defaults. When you are finished, click Create Report in the upper right-hand corner. Step 5: Finished! Now you'll land in a template report. From there you can either edit to your liking or start a fresh report. 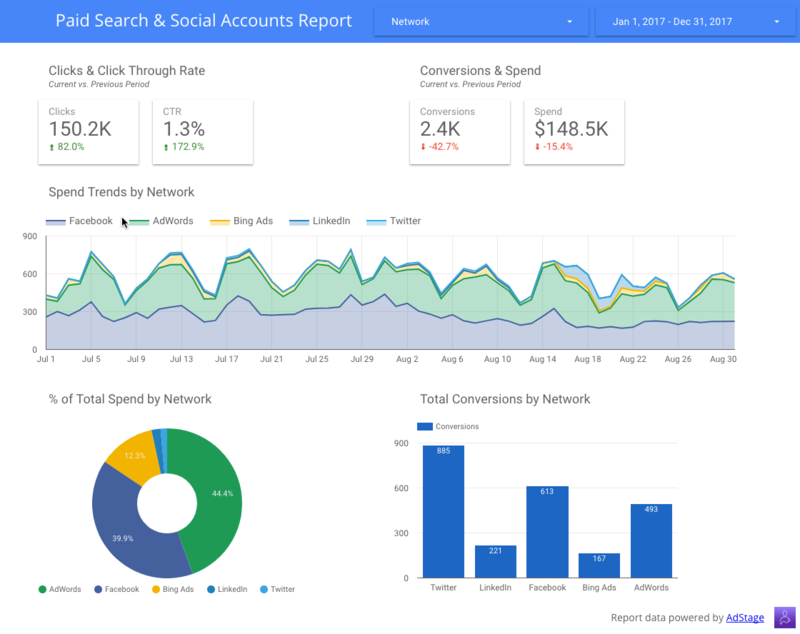 Have questions about connecting with Google Data Studio? Feel free to reach out to us at support@adstage.io.